Uniqueness is an pretty subjective concept. Humans have an intrinsic psychological sense of uniqueness, our internal consciousness versus the outside world. Whether each person is a really a precious little snowflake or not is up for debate, but we can at least define ourselves as unique against the rest of the animal kingdom. We have complex language, tool-making abilities, art and culture and an ability to conceptualise solutions to problems. Other animals possess one or more of these traits but the human genetic cocktail is mixed in such a way as to create at least the illusion that we're divorced from the rest of the animal kingdom. To understand, the human brain has to be splatted onto the slab; pulled apart; sliced up; poked; prodded; examined under a microscope - what separates this particular lump of bloody pink jelly from what's knocking around inside, say, a cat's skull? Fortunately we had two scientists in the Royal Institute last night that could supply some of the answers. The first speaker, from the University of California, was developmental neurobiologist Arnold Kriegstein. He began by showing us the physical differences between humans and our distant and close animal relatives. What's first impressed upon us is that size doesn't appear to be a crucial factor in intelligence: we have far from the largest brains in the animal kingdom and we don't even have a particularly striking brain to body size ratio (humans are about on par with the seal apparently). One of the things that sets us aside is a high degree of cortical folding. The cerebral cortex is a sheet of neural tissue that forms the outermost layer of the cerebrum. If we're trying to work out what makes us human, the cerebral cortex is the best place to start, there's a lot we don't know about the brain, but we do know that this structure plays a key role in memory, awareness, thought, language and consciousness as a whole. We're shown mice and bird brains, both with a notably smooth cortex - a far cry from the 'wrinkled' and folded brains of primates. This cortical folding greatly increases the surface area of the brain, to such an extent that more than two thirds of the human cortex is buried in these grooves. Notice Mouse B's cortical folding. In terms of brain development Kriegstein shows us the fascinating result of blocking expression of one gene (Trnp1) in mice, researchers are able to make their normally smooth brains develop these cortical folds. Now, the first thing that sprang to mind for me was "Cool! Superintelligent mice!". 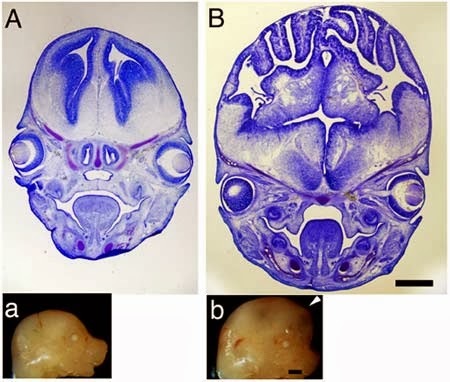 Unfortunately it turns out that tinkering with the basic architecture of a mouse embryo's brain isn't great for the mouse embryo - and they die after about 10 days. But though there's no smart mice, this is fantastic a great proof of how drastic physiological changes in the brain can arise from minor genetic mutations. Kriegstein went on to explain that though the human cerebral cortex isn't the largest, or the most folded, but that it contains the largest number and probably the greatest diversity of neurons and more complex circuits within them. Of course, just understanding the structure of the brain and how neurons form only gets us part of the way in understanding the uniqueness of humans. But knowledge of this structure and the role it plays in neurone formation provides a scaffolding around which we can begin to understand the actual mechanics of thought. To even begin to understand thought it's instructive to look to our closest relatives in the animal kingdom. By understanding the differences between higher primates and humans we can begin to pick apart our differences. But what if there were 'another' type of human to compare us against? Fortunately, there is. Or to be more precise, there was: Neanderthal man. Explaining this concept to us was Svante Pääbo, from the Max Planck Institute for Evolutionary Anthropology, lead of a team researching and analysing the DNA of Neanderthals and another homo sapiens subspecies, Denisovans. Neanderthals present us with a rather bizarre thought experiment: an extinct species of human. The idea of species of humanity is a bit skin-crawling: we have enough problems with racism arising from minor genetic variations like skin colour, let alone a whole other 'type' of people walking the planet. We know that they lived in complex social structures, we have evidence of them caring for injured members of the groups they lived in. We have evidence of tool use, and complex behaviours like controlling fire, constructing shelters and skinning animals - even constructing traps to snare animals. They were about as like us as it's possible to be, but they weren't us. 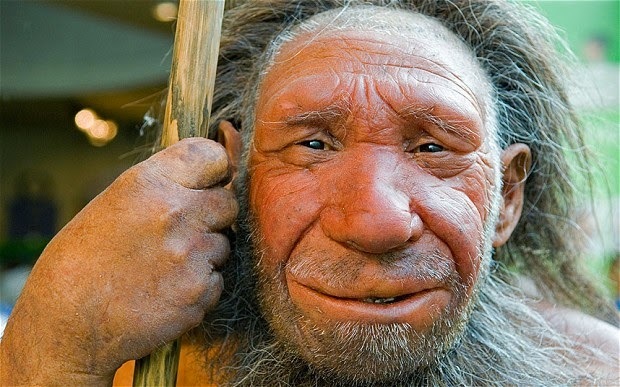 It's impossible to know exactly what happened when homo sapiens met homo neanderthalensis, but as there aren't any Neanderthals walking the streets we can be sure that one way or another, we wiped them off the face of the earth. The two hypotheses are replacement (we killed them) and assimilation (we got mad rutty). Pääbo's team has begun to definitively answer this question. Using new advances in computer DNA sequencing and some well preserved remains he's managed to sequence genomes of both Neanderthals and Denisovans. 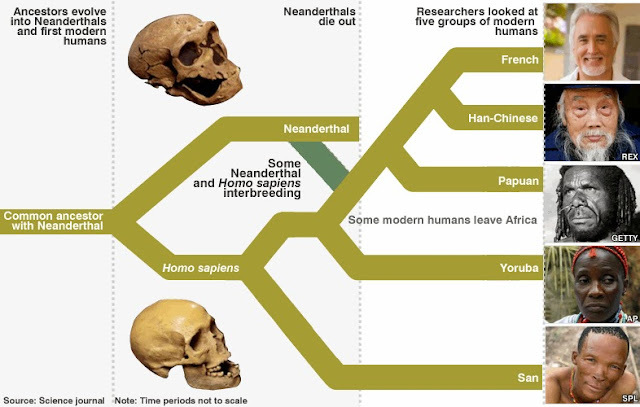 Comparing these genomes to examples from around the world shows us that while there was interbreeding between human and Neanderthal/Denisovans, there was nowhere near enough of it for us to have assimilated them completely. So, did we out-compete them for resources or were we just better at tribal warfare than them? Initially it's a bit depressing that the reason there's only one species of human is the result of a talent for genocide. I guess the planet just wasn't big enough for the both of us. It's not that early modern man was particularly evil and calculating in wiping out his genetic cousins, more that our success can be put down to creativity, better use of resources and, apparently a sense of adventurousness absent from Neanderthals and Denisovans. Judging from the locations in which their remains have been found, these other species of human appear to have had an aversion to crossing large bodies of water. They may have had boats but it takes a certain madness to float off into the Pacific Ocean in the hope of finding some outcropping to live on. Countless coracles of terrified and starving men and women drifted to their anonymous deaths in a vast watery desert before a few happened to chance across something like the distant Easter Islands. Perhaps it's this reckless bravery that gave us the edge, making the crucial leaps into the unknown that Neanderthals and their ilk never could. Even after these lectures I don't know what exactly separates us from the rest of the animal kingdom. Neither do the experts: in the question and answer sessions both men cheerfully admit that they're clueless as to how things like consciousness work. But the knowledge that these men are contributing give us a crucial foothold on a mountain that once looked insurmountable. In understanding the formation of the brain and comparing ourselves to extinct species of humanity we begin to answer one of the oldest and biggest questions in science: who we are, what we are and why we are. Thanks to The Company of Biologists for supporting this event, and thanks to the Royal Institution for the invitation.